Summertime is fresh zucchini, eggplant and tomato time. This recipe is well worth the time you put into it. 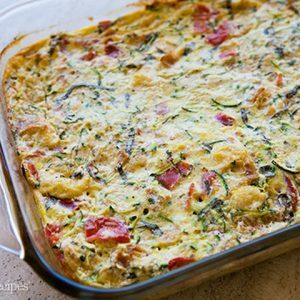 Serve to family and friends as a deliciously healthy alternative to lasagna!! Try preparing your oven roasted tomatoes in advance and keep them on hand. Prepare veggies. Begin by heating olive oil in a large sauté pan until it shimmers. Once the oil is hot, toss in the onion and garlic first and cook over medium high heat until translucent. 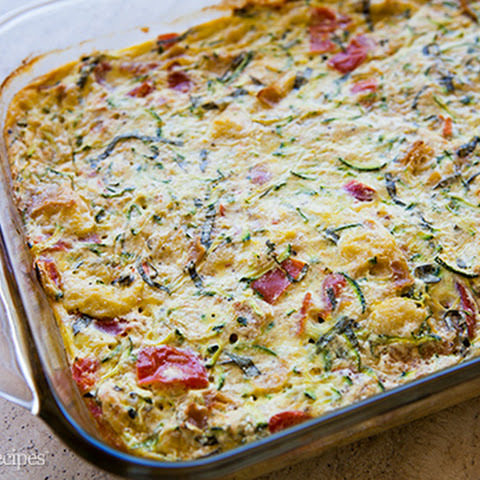 Add the zucchini and toss to combine. Continue to cook, tossing and moving the veggies about for about 2 minutes. Turn up the heat to high. Add the eggplant and roasted tomatoes, toss with other veggies and cook until everything is lightly golden, about 5 minutes more. You just want the veggies crisp tender at this point because they will be cooked in the oven. Cooking time will vary according to your burner heat. Add the herbs – basil and oregano— and 1 teaspoon of the lemon rind.Toss again to combine and remove from the heat. Taste for seasonings and adjust to your taste. Set aside while you prepare the ricotta filling. In a medium bowl, combine ricotta cheese, sugar, ½ cup of mozzarella and garlic salt if using. In another bowl, whip egg white until frothy. Add whole egg and continue to whip until light and lemon colored. Add the egg to ricotta mixture and stir vigorously to blend thoroughly. Zest the lemon into the ricotta and add your handful of coarsely chopped fresh parsley. Stir to blend. In an ovenproof casserole dish large enough to accommodate the ingredients, start by adding ½ the veggie mixture to the bottom. Pour the entire amount of the fluffy ricotta mixture over top and spread to cover. Add the remaining ½ of the veggies and top with ¼ cup fresh mozzarella. Bake in a 350 degree oven for 1 hour or until the ricotta sets and the dish is bubbling hot. You will need 12 fresh tomatoes (kind you like), ½ cup olive oil, 1 Tbl. Balsamic vinegar, 2 teaspoons honey and chopped fresh thyme leaves. Line a large rimmed baking sheet with parchment and drizzle with olive oil. Cut the tomatoes in half crosswise. With a teaspoon, scoop out the center of the tomato, removing most of the seeds. Set the tomatoes, cut-side up on the baking sheet. Combine olive oil and balsamic. Add 1 teaspoon olive oil mixture to each tomato center. Bake in a 425 degree oven for 45 minute or until they are brown on the edges and collapse a little. You can store these in the refrigerator on a sealed jar for 2 weeks or freeze them for a few months.